This may just be the future of ice cream. Cauldron Ice Cream puffle cones have taken over the West Coast, and they are the most beautifully odd-looking things I have ever seen. Adopted from a popular Hong Kong street snack called an egg waffle, the puffle cone is made from a sweet, egg-based batter that puffs up into bubbly globules that tenderly cradle your ice cream of choice. The ice creamery, based in Santa Ana, California, is currently the only place to offer this confection outside of southeast Asia, and it had no idea just how much attention the creation would get when it was introduced to the menu just a few weeks ago. The beige, bulbous cone looks like a cross between honeycomb and bubble wrap, meaning it's pretty much Instagram gold. Cauldron Ice Cream has always outdone itself, creating eccentric ice cream flavors from liquid nitrogen in front of customers' very eyes. 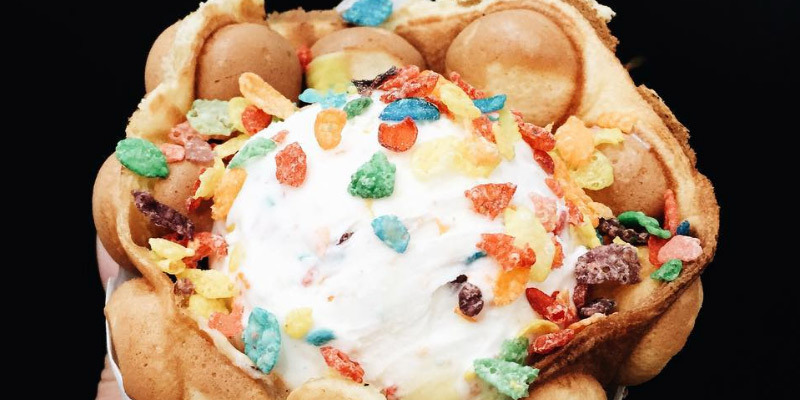 When it comes to new foodie discoveries, the puffle cone has quickly overshadowed SanFran sushi burritos, and has given non-Californians another reason to get to SoCal, like, yesterday. It's not hard to understand why.